The best way to stop children getting fat is to ban junk food advertising, we are told. That will stop children nagging their parents for the latest McHappy Meal and toy. It's all about stemming pester power. But here's a suggestion from left field. If more children are getting too fat, it's because more parents are having trouble saying no. In other words, the rise in pester power is directly related to the decline in parent power. She claims that others claim advertising is the single cause of childhood obesity (though she doesn’t even cite an example of a single person or entity who has made this claim), dismisses this, then argues that the single cause is actually lack of parental power. She has created a false dichotomy. Reality doesn't tend to be so black and white I'm afraid. It couldn't be that both these things affect what children eat could it Janet? I’ll Spin Another Hypothesis. Ads tell children what they ought to want to eat, and parents tell their children what they will eat. Children pester the parents to have what’s advertised and some parents give in. If junk food weren't advertised, then I'd wager children would pester parents less, and consequently… I’ll let you figure that out. Of course, that's not to say she doesn't go on to raise a valid point, that parents and people in general need to take greater personal responsibility. But there's nothing wrong with making it easier for parents, not harder, surely? If ads don't have an effect, why would McDonald's et al fork out millions of dollars pointlessly? Ah, now I get it. If we can’t, as a society, make decisions about what is advertised and when, we'll be obligated to bring back ads for cigarettes. 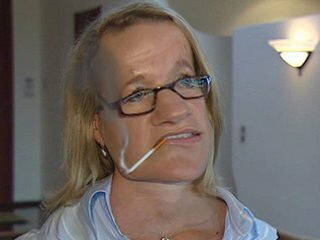 I don't wish to Impugn Albrechtsen's Motives, but the photo above gives it away (and shows the horrid consequences of smoking for years). Technorati Tagged - Fallacy, Skepticism, Single Cause, False Dichotomy.